An average of 30 people saw each post, that’s approximately 33% of our 91 Facebook fans. I think that Facebook’s recent changes had a lot to do with that. 20 out of the 28 ebooks featured were checked out during the time of the promotion (February 1-28). A handful were checked out multiple times. I was pleasantly surprised by this figure considering the low number of people who actually saw the posts. Almost all likes, shares, and comments on the Blind Date posts were by other librarians or library pages. This was disappointing to me. I had hoped to garner more attention from our actual, everyday users. However, I’m very glad that fellow librarians liked the idea. In fact, another West Virginia library adapted it for their own social media accounts. Titles selected were a mix of popular ebooks that our patrons seemed to have missed and ebooks that I thought our patrons would enjoy based on what they were already checking out. Despite the fact that this promotion didn’t quite meet my expectations, I will try it again next year. I think when we have a larger fan base, it will work better. I may expand it to other social media platforms. This could work really well on Pinterest and Twitter. Image Credit: “eBook Reader” by goXunuReviews on Flickr. It was time to switch up displays in the YA Room again. 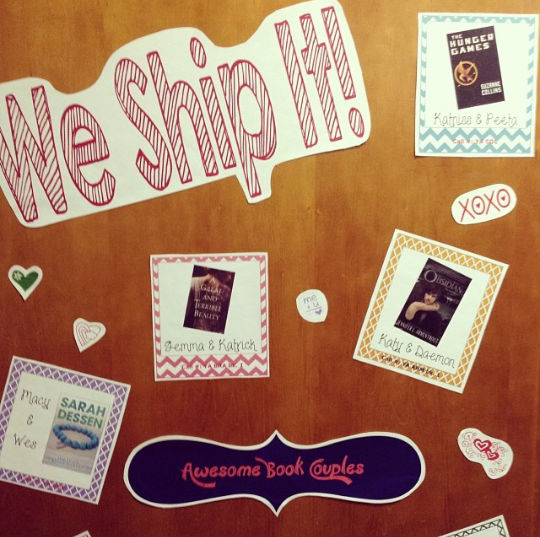 For Valentine’s Day, I did a display of favorite YA character ships. 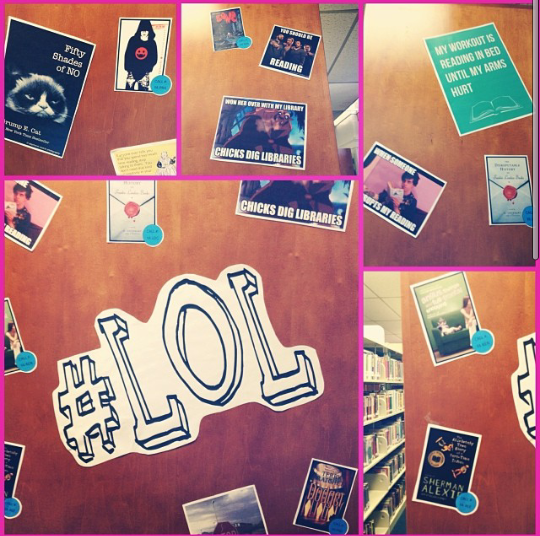 I also put up a display of YA humor titles with literary memes, mainly because I wanted a reason to display that Fifty Shades of No picture. Almost every library in the United States has a Blind Date with a Book (BDWAB) display this February. Why wouldn’t they? It’s a great idea and patrons love it. If you don’t know, the basic concept of BDWAB is patrons check out wrapped books that have been selected and displayed by library staff. 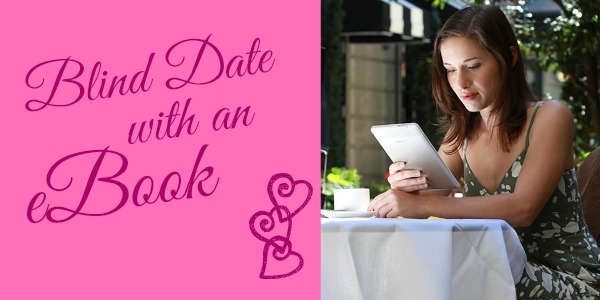 Patrons don’t know what they’ve got until they get home and unwrap the book, hence why it is called a “blind date”. Some libraries mix it up by adding short descriptions or “personal ads” on the wrapping or they might offer an incentive to check out the books. Regardless of optional pieces of flair, BDWAB encourages people to read outside their comfort zone and that’s always awesome. I decided to see if this could somehow translate to the ebook world. For our digital library’s Facebook page, I created images with three-word descriptions of an ebook. Then I uploaded the images with a shortened link to the corresponding ebook on our OverDrive website, that way our Facebook fans don’t see the title until they actually click the link and go to our OverDrive site. I used Bitly as my url shortener, because I love Bitly and it’s an easy way to keep track of how many people are clicking the link. I plan to post an image a day throughout the whole month of February. So far, there hasn’t been much response. Our Facebook page is relatively new, so we don’t have a large fan base yet. Also, I started the campaign on a weekend and Facebook engagement is typically low on weekends. I hope to see more engagement as the month goes on. Even if the response remains low, it’s a fun experiment. Check out the gallery below for the images I created. FYI, I used PicMonkey to make these. We’ve all seen those posts on Facebook of a kid holding a sign that says “If I get 1,000 likes, my dad will take me to Disneyland!” or something along those lines. These type of posts almost always reach the number of likes requested. Well, I wanted to see if we could make this kind of post work for libraries. I grabbed a couple of coworkers, we made a sign, took the above photo, and then posted it via the library’s Facebook page. It has been our most successful post to date (we’ve been on Facebook for 3 years and I’ve been page admin for about a year). 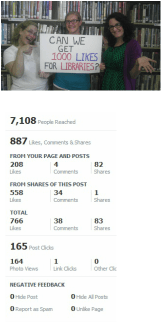 While we didn’t reach our goal of 1,000 likes, we did come close and over 7,000 people saw our post. That’s a lot of free publicity for our library! Overall, this experiment reinforced a belief that I already held – that people are visual. If I had posted “Can we get 1000 likes for libraries?” as a text status, it would not have garnered the same amount of attention. Combining a visual post with text seems to work best for us and our patrons engage more with these kinds of posts. Right now, I’m considering expanding on this idea. I really like what OverDrive is doing on their Facebook page. They are posting pictures of their staff holding signs with questions like, “What is the first book you remember reading?” and “Who is your favorite literary villain?“. This seems like a great way to showcase library employees’ personalities while establishing a rapport with patrons. What are some interesting ways your library is using Facebook? 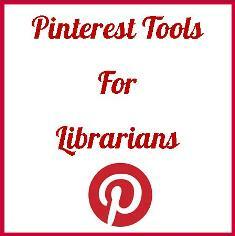 I manage our library system’s Pinterest account and it can be very tricky at times. Days when I’m out of the office, instances when I want to fill a new board without inundating our followers’ dashboards with pins, or times when I want to pin an image from a website like Facebook: these situations can be problematic. So, I’ve been using two FREE tools that help solve these issues: Reachli and PinGraphy. Reachli: This website allows you to create campaigns and then track their success. Install the bookmarklet and you’re ready to go. Reachli’s best feature is that it allows you to pin from Facebook (something that you can’t do with your Pinterest account alone). This is great for sharing Facebook events with your followers. Reachli also lets you change the source url while you’re pinning with their bookmarklet. For me, this is particularly handy because I have to open images in our catalog in order to pin them and then edit the pin to change the source url to the actual catalog entry. It can be a looooong process. With Reachli, I can just change it as I’m pinning. Bada bing, bada boom, I’m done! It is a super time-saver! You can also pay to promote your pins, but I’m too cheap for that. PinGraphy: This website is AWESOME because it lets you schedule pins! It makes me so happy. You can schedule pins for days when you’re on vacation, for certain times of day to maximize visibility, or pin a bunch of stuff and stretch out the time between pins. It is really annoying when I login to Pinterest and see a ton of pins from one user, like they just took a giant pin dump on my dash. Don’t be that person, use PinGraphy to schedule time inbetween those pins! Pingraphy also syncs to your Pinterest account so you can view stats and analyze the success of your pins and boards. Love it! ps. Pinstamatic is great, too! It lets you add a lot of great stuff: text, website snapshots, music, and more. Definitely worth giving a shot. Update: 6/7/2013 – PinGraphy is no longer a free tool. At the moment, Reachli is working on a pin scheduling feature. Update: 9/13/2013 – Reachli now has a scheduling feature. It is sweet.